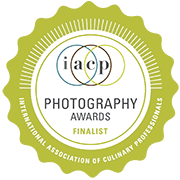 The IACP Food Photography and Food Styling Awards honor the best in food photography each year, both commercial and editorial work. You can submit in four categories: Best Commercial Food Photograph; Best Editorial/Personal Food Photograph; Best Food Styling in a Commercial Food Photograph; and Best Food Styling in an Editorial/Personal Photograph. Judging panels consist of prominent food photographers, art directors, food editors, book publishers, and others. Our contest is open to both IACP members and non-members. This category applies to photographs that are commissioned and used in any advertising or marketing campaign, print or online, or in product packaging, collateral, or on a corporate or business website. The period of eligibility is the current calendar year. This category is for photographs that have been used in any book, magazine, newspaper, blog or other publication, print or online. The photograph may also be taken as a personal creative project. The period of eligibility is the current calendar year. This category applies to a photograph’s food styling only. The photograph must have been commissioned and used in any advertising or marketing campaign, print or online, or in product packaging, collateral, or on a corporate or business website. The period of eligibility is the current calendar year. This category applies to a photograph’s food styling only. This category is for photographs that have been used in any book, magazine, newspaper, blog or other publication, print or online. The photograph may also be taken as a personal creative project. The period of eligibility is the current calendar year. This award is voted on via on online ballot and is open to members and non-members. The winner is announced during the live awards ceremony.